Rimmel London prides itself on being affordable and stylish, offering products that are vibrant in color and long-lasting. Recently, the Rimmel London team sent our guest reviewer, Rachel Green a few nail polishes to test. See what Rachel had to say when she used the various products over a period of days. This review was originally published on Rachel’s blog Uncurable Craving and republished with her permission. This is some color! A nice creamy, mostly opaque (@ 2 coats), bright tangerine. I’ll have to report back on how long it lasted. The bottle says up to 10 days. I’d love it if it holds up even 5 days before chipping. I do a lot with my hands, so I’ll put the polish through its paces. This color makes me happy. On my toes is the quite lovely purple Rimmel Lasting Finish Pro nail polish in Violet Metal. I find it to be a violet with a reddish undertone with a blue iridescent sheen, which is an interesting combo. I polished my toes 3-days ago, photographed them today and they’re still looking great. I did 2 coats of polish with basecoat and topcoat. The polish is said to last up to 10 days. We shall see! The nail polish price is affordable at $3.99. I’m kinda undecided on the wide brush that Rimmel nail polishes have. On the one hand, I like that less strokes are made yielding smoother application. Conversely, I like thinner brushes for when I try to get the polish close to the skin. I find the brush sets the Rimmel polishes apart and innovative. All in all, I really like this purple and I’m curious about how it’ll look on my fingernails. NOTE: I received this polish generously from Disarray Magazine. I do not believe in biased posts and even if I get something free, it won’t ever affect my opinion. So tonight I ended up having to redo my nails because they looked like this. I used Rimmel’s Lasting Finish Pro in Sunset Orange. On the bottle, it says the manicure can last up to 10 days. I’ll give it to Rimmel it lasted 3 days then showed wear around the cuticles, at end of nails showing white and some minor chips on nails. I wished the polish lasted more like 6-10 days, but what can ya do? All I can do is chock it up to the fact that I use my hands a lot, typing, using a cash register, cleaning, but… I still think the polish should last longer especially with the use of base coat and top coat. Sigh. One day I will find a long lasting lacquer. At least, the color is fab! 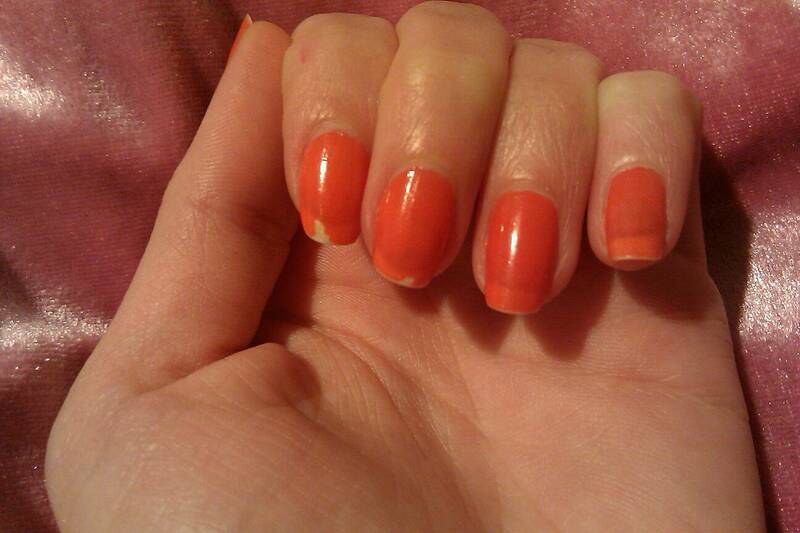 So, I just removed the chipped Rimmel Sunset Orange polish. I did one coat of Rimmel Lasting Finish Pro in Cherry Fashion one coat over base coat and then top coat. I used a teardrop crystal on my ring finger and affixed that with topcoat. I like this bold cherry color. Reminds me of a classic 40s or 50s lip color. I was impressed that it was opaque at one coat. I’ll see if this polish fares better than the last in terms of chipping time. Polish provided to me free by http://www.twitter.com/disarraymag. This is an unbiased post.